Lori Ajax, Alcoholic Beverage Control investigator, cites an underage female in connection with attempting to use false identification at Kip's Restaurant and Bar on Saturday night. Sometimes it's in the way they smile. Other times, it's the distance between their eyes, the shape of their ears, or their inability to remember the zip code of a Texas town whose streets they've never walked. As plainclothes police officers examined suspicious IDs in a hallway at Kip's Restaurant & Bar in Southside Berkeley Saturday night, Alcohol Beverage Control Investigator Lori Ajax turned around, shrugged and smirked. 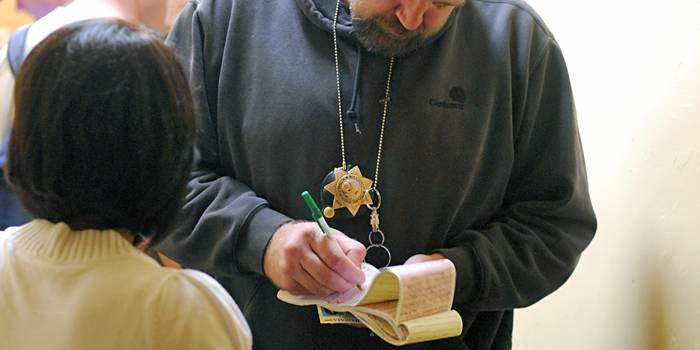 "I ran out," he said, prompting another officer to retrieve more citations for fraudulent IDs. While police gave out 180 alcohol-related citations in Berkeley last weekend, researchers say the misconceptions of alcohol use in college manifest themselves in incoming students, especially those who are moving away from home for the first time. A survey done last fall by California Safer Schools Coalition, a research organization, found that UC Berkeley undergraduates estimated that 36.5 percent of their fellow students drink one or two times every week, compared to the 26.5 percent that actually do. The same survey found that 63 percent of UC Berkeley undergraduates drink once a month or not at all. However, in light of the stabbing death of UC Berkeley senior Chris Wootton on May 3 and the falling death of Alan Hamai less than 24 hours after his commencement ceremony, Berkeley police officers say the predominantly student-populated South Berkeley is in need of a wake-up call. alcohol or drug-fueled, incidents they say blend well with the substance-related problems of the Southside. While patrolling the streets in an unmarked car on Saturday, Berkeley police Officer Stephen Burcham said he thought the post-football game crowd could make for a busy night. "Because students live close (to campus) we don't have a lot of drunk driving," he said, while carefully scanning Telegraph Avenue. "Unfortunately, we have people stepping in front of cars, people falling victim to crime and drunken testosterone-fueled fights." According to Burcham, the makeup of Southside-the bars, the late night eateries and the large groups of college-aged kids "just hanging out" at all hours of the night-can lead to a hostile, and sometimes unforgiving, environment when irresponsible alcohol use becomes a factor. With the aid of grants totaling $89,000 from the State of California Department of Alcoholic Beverage Control, the Berkeley Police Department says it is upping its presence in order to deter habits that could last a lifetime. When the department first started receiving the grants in 2003, 35 to 40 percent of businesses that sell alcohol were caught furnishing alcohol to minors. But according to Burcham, that number has since decreased significantly and is now in the high teens. During the "TrapDoor" operation, in which bouncers hand off questionable IDs and their holders to police, Burcham commented that local bouncers have seen "thousands upon thousands of IDs" and could pretty much spot a fake "a mile away." However, he added, experienced bouncers do not always prevent minors from trying to gain entrance to bars. According to Burcham, the first two weeks of college are the most influential on freshmen. That is when the habits of binge drinking most often onset because, as Burcham puts it, at the end of the night they do not have to be sober enough to sneak past their parents. While binge drinking remains a concern of the Party Safe at Cal campaign, the California Safer Schools' survey found that only 4.9 percent of UC Berkeley undergraduates consume seven or more drinks when partying. Karen Hughes, the coordinator for Party Safe at Cal, said students form their drinking-or their non-drinking-habits during their first few months after entering the college social scene. While irresponsible drinking may not be as common as students think, both police and researchers say the drinking decisions made by incoming students can affect their day-to-day lives.